ICL had been formed as a 10%-nationalised company in 1968 by the Harold Wilson Government. It brought together a disparate range of computer companies, including English Electric, LEO (the J Lyons tea-shop empire which had built the world's first ever business computer) and Marconi, before becoming virtually bankrupt by the beginning of the 1980s. Rob Willmot, former head of Texas Instruments' micro project, joined as MD in 1981 and managed to turn the 33,000-employee behemoth around. It was wholly acquired by Fujitsu in 1998, after a long-running "joint working" arrangement. ICL's "personal computer" wasn't actually a PC in the increasingly-dominant IBM sense, but was a CP/M or MP/M system which was essentially a re-badged RAIR "Black Box", although this did share the same 8088 CPU as IBM's 5150. It also remained steadfastly wedded to ICL's concept of computers as being multi-user systems - in this case supporting up to four additional terminals. Not everyone thought this was a good idea, with Personal Computer World's Guy Kewney referring to buyers of such machines - with the advent of proper PC networking - as "ignorant lunatics". When it was launched, the ICL, with a single VDU, retailed for around £2,895, or £9,730 in 2019 money. The first Ethernet-based networking equipment for PCs appeared at the beginning of 1983. It was built by 3Com and appeared on an Altos micro and at the time was considered a brave move, as "Ethernet is widely agreed to neither fully operational, nor cheap" - the first 3Com cards cost around £700 (£2,350 in 2019), but at least they came with a network-based game called Etherman. Despite the "experimentalism" of the new technology, it didn't take long before other companies were also shifting networking hardware. MicroAPL was one such company, offering a custom Ethernet system based on the S-100 bus. MicroAPL's MD Robert Bittlestone said of multi-user machines in the light of Ethernet that "without networking, the danger was that we would find ourselves selling bigger and bigger centralised microcomputers, eventually re-creating the mainframe monsters we were trying to replace". 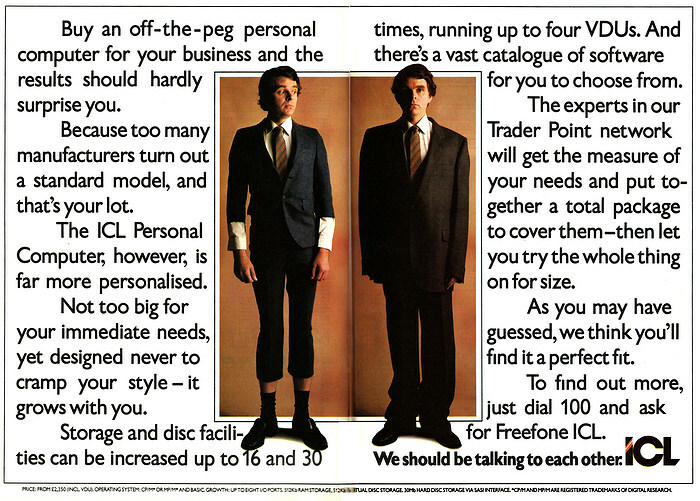 The Trader Point network mentioned in the advert came about as the result of ICL's lack of experience in the microcomputer industry, an admission that managing director Wilmot - the man of a thousand spellings - was happy to make. Instead, it would lend its name to a network of dealers - the Traders - who would sell the machines on behalf of ICL, even though some of those dealers were worried that they might be up against ICL's own salespeople in the same market. As well as ICL's own RAIR box, it was expecting to sell micros from the Wordskil 8800 range, and an "up-market graphics computer" known as Perq. Naturally, ICL was also expecting to shift its computers in "very large quantities" to the biggest international and national companies, which it didn't, but at least it had a head-start on its main competitor, IBM, which by the time Trader Point as launched still hadn't got around to actually selling its 5150 IBM PC into Europe.